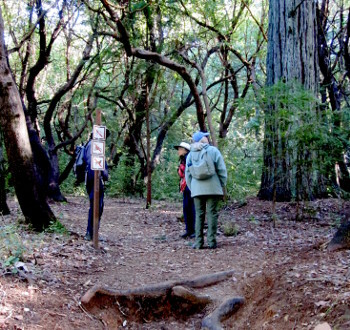 Described below is one seven-mile hike—or with shorter variations, down to five miles—in the Fall Creek Unit of Henry Cowell Redwoods State Park. 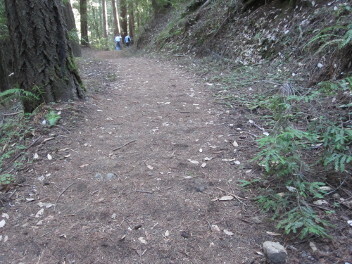 The photo above shows the trail along Fall Creek. This is a delightful hike. 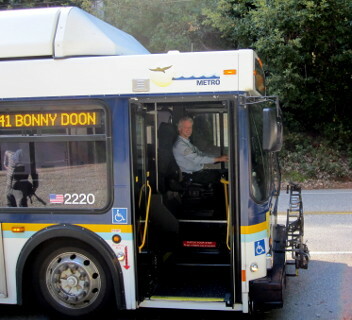 On weekends, start by boarding the #42 Davenport/Bonny Doon bus at the Pacific Avenue METRO center in downtown Santa Cruz. The bus leaves there (from Lane 1) at 8:30 a.m., and after stops on Mission Street, heads up Highway 1 to Davenport (8:50 a.m.), then up Bonny Doon Road, arriving at Pine Flat and Empire Grade at approximately 9:22 a.m. There is only this one morning bus. Click on the button in the first column for the relevant route. This should display all the stops on the route, with their locations and times. You can easily see exactly where the bus will go—especially helpful if you want to board at some stop other than on Pacific Avenue. The bus fare (exact change) is $2 ($1 if you're 62 or over). A second bus fare will be needed for the return trip in the afternoon. When you get off the bus at Pine Flat Road and Empire Grade, all you have to do is to cross Empire Grade, and about fifty yards up the road, on your right, is the trail entrance to the State Park, marked only by a post with three small signs on it. Here's Mark, who just let us off the bus at Pine Flat Road. The start of the trail is marked by an innocuous sign. We've made a useful map of the complete route for the hike (marked with red dots), with a thumbnail link at the left. (Click on this thumbnail image to enlarge it.) A pdf of this map is available here. 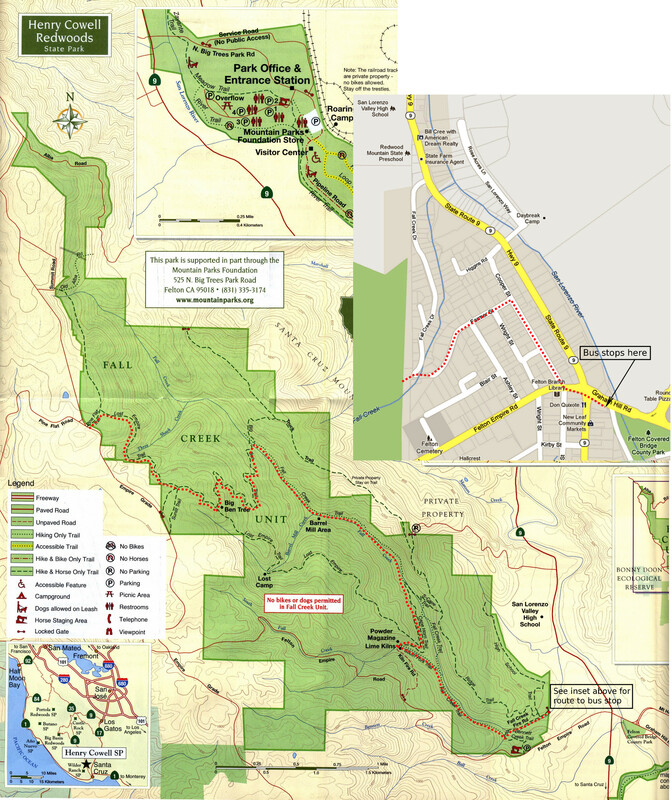 If you plan to go on the hike, we suggest printing it out so you can take it with you. As you may see from the map, our route is almost all downhill, starting at an elevation of approximately 2200 feet, and ending at approximately 400 feet. After a short distance (0.2 miles) from the start, you'll reach the Lost Empire Trail. Turn right here, and continue on down to arrive at the “Big Ben” Tree, perhaps the last remaining old growth redwood in the Fall Creek watershed. Then, turning left to descend on the Big Ben Trail, you'll eventually reach Fall Creek, where the trail crosses the creek. Fall Creek flows over rocks of granite. The granitic rocks underlying Ben Lomond Mountain (including the Fall Creek area and parts of the UCSC campus) correlate in both composition and age (Cretaceous—over 100 million years ago) with some of the granitic rocks in the Sierra Nevada. The prevalent theory at present is that the local granitic rocks (along with those in the Santa Lucia and Gabilan ranges) were once the southern part of the Sierra Nevada belt, but have been offset several hundred kilometers toward the northwest along the San Andreas and related faults. These granitic rocks were originally magmas that occurred in large magma chambers (plutons) beneath a string of Andesite volcanoes that were subsequently eroded as the Sierra Nevada trend was uplifted. Amazing. So we have, right here in our own back yard, a piece of the Sierra Nevada! No wonder it is reminiscent of those mountains. Also, the presence of the granite in the streambed is one reason that the water, which forms the water supply for the Felton community, is of such high quality. 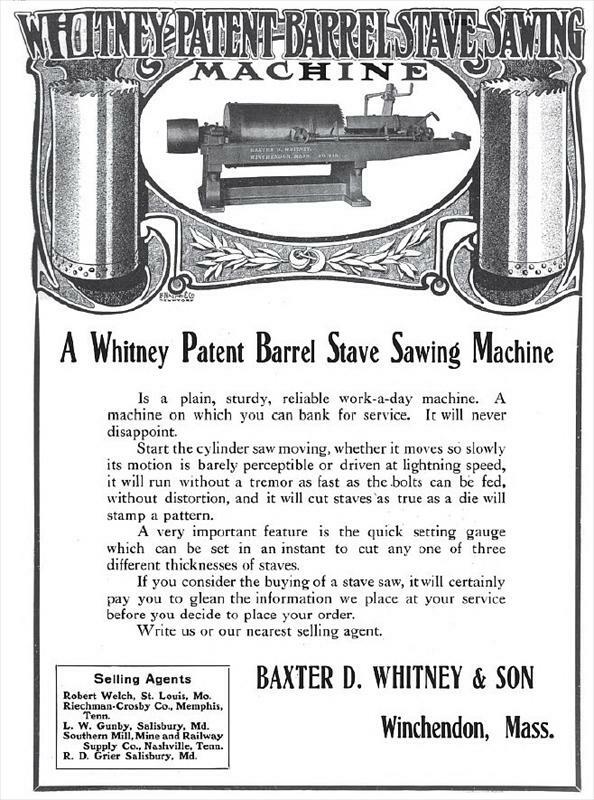 The Barrel Stave Sawing Machine. Now just descend on the Fall Creek Trail to reach, at approximately 3.7 miles from the start of the hike, the Barrel Mill Site, which between 1912 and 1925 was full of noise and active industrial activity. 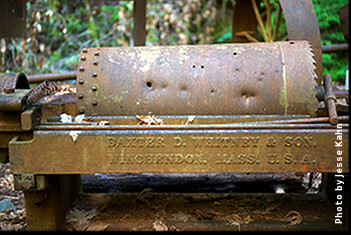 The centerpiece is the “Barrel Stave Sawing Machine”, manufactured by Baxter D. Whitney & Son, in Winchendon, Massachusetts. It was driven by a very large Pelton wheel, some remnants of which are still on the site. The barrels constructed here (the sign says about 60,000 of them, or an average of over 12 per day) were used to transport the lime that was mined from the quarry and baked in the kilns that we'll see later. You might reach the Barrel Mill Site some time around 11:30 am, so it's a good place to stop for lunch. The Cape Horn Trail may have been a rail line. After you leave the Barrel Mill, head on down Fall Creek for about a mile, until the trail crosses the creek on a bridge. Then head up the Cape Horn Trail, which follows an old roadbed. If you look closely, you may notice ripples in the roadbed, perhaps evidence of long-vanished railroad ties. Could this have been a rail line? 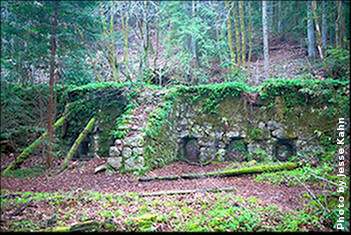 After a bit, having climbed and descended on the old road, you'll arrive at the lime kilns, another industrial site where high-quality limestone was quarried, baked (burning thousands of cords of redwood), and shipped out in barrels in the early 1900s. At this point you will have walked approximately 5.3 miles. From the kilns, head on down the Fall Creek Trail, where on your right, when you're in what seems like the bottom of a ditch, you'll pass a gigantic pile of rocks, dumped there—a kind of slag pile from the quarrying operation. 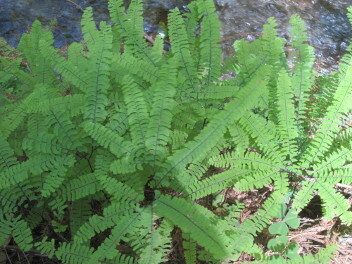 Five-fingered ferns grace the banks of the stream. About four-tenths of a mile below the kilns, at a bridge, there is the joining of the two forks of Fall Creek, cascading over granite rocks. Below this point, much of the old road has eroded into the stream, leaving only the narrower trail. 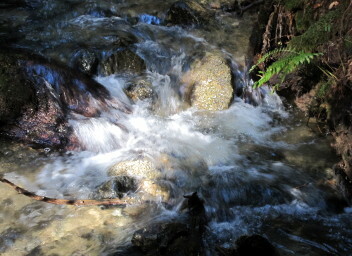 The stream cascades over logs, creating good habitat for the trout in the stream. At approximately a mile below the kilns, you'll come to the junction with the Bennett Creek Trail, which leads up to a parking lot on the Felton-Empire Road, but keep on, crossing a substantial bridge over the creek, and after 0.3 miles you'll reach the gate at the boundary of the park. Here, where there is a fish ladder, some of the water from the creek is being pumped out, to be used by those of the Felton community. 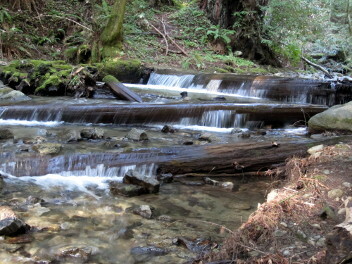 The stream cascades over logs. You'll have walked approximately 6.6 miles since the start of the hike. It's about a ten-minute walk to our bus stop from here. To reach it, cross the creek over the foot bridge, and follow Farmer Street down to its end at Cooper Street, turn right, and walk out to the Felton-Empire Road. Cross Felton-Empire and walk down it to cross Highway 9. About half a block down Graham Hill Road, just prior to the bridge over the river, is our bus stop. A bus headed to Santa Cruz (#35 or #35A) will stop here frequently (shortly after the hour on weekends, and after the half-hour on weekdays). You don't need to be nervous as to whether you'll make the bus. On a recent hike along the route described above (and on our map), after walking leisurely down the slopes, we caught the bus that stopped here at about 3:10 p.m.
We board the bus in Felton. Shorter walks: If you want a shorter walk, try coming down the Lost Empire Trail instead of the Big Ben Trail, for a total mileage to the Felton bus stop of approximately 6.0 miles. For a still shorter walk of about 5.0 miles, get off the bus at Sunlit Lane, walk in to the Big Ben Tree, then down the Lost Empire Trail and the Cape Horn Trail to the Lime Kilns and then on to the Felton bus stop. 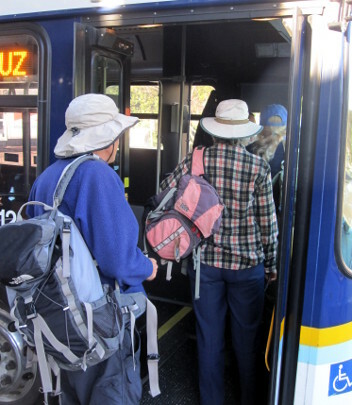 Other possibilities: Other loop hikes in the Fall Creek watershed, of any length at all, can be made using only the San Lorenzo Valley bus (#35 or #35A). Just get off the outbound bus at the next stop after Felton Faire (just prior to the Highway 9 intersection), and follow the red dots on our map (above) in reverse.